Soil pH: Is your soil on acid? Soil pH is one of the factors that affect what plants will grow well for you. My style of gardening is to grow plants that are suited to my soil rather than changing the soil chemistry to suit the plants. I confess that, like most gardeners, I’ve never tested my soil, but I know from reliable sources that the soil pH in my region is great for growing most plants, which fortunately suits my philosophy. The pH scale measures whether soil is acid or alkaline. The numbers on the scale run from 1 to 14, with neutral at 7. Levels below 7 are rated acidic; levels above 7 are alkaline. 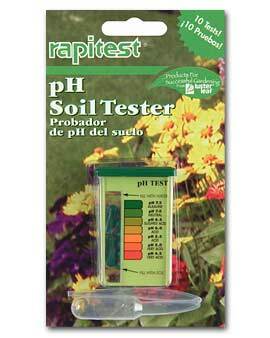 To find out your soil’s level, test it with a pH soil test kit , or have it tested professionally. Soil pH affects the nutrients available for plant growth. Most plants prefer a slightly acidic pH level of 6.0 to 6.5. Fortunately many soils oblige by falling within this range, but the soil in some regions is more acid or quite alkaline, and that limits which plants will thrive there. In very alkaline soils – and above – acid-loving plants such asrhododendrons and azaleas are not able to get the necessary nitrogen, phosphorus, iron and other nutrients that are dissolved in soil moisture. Their roots actually need acidic conditions to be able to absorb soil nutrients. You can adjust soils to modify their pH, although this tends to work for only a season or so. To make acidic soils more alkaline, add lime. To make alkaline soils more acidic, add a combination of sulfur, peat, and use fertilizers formulated for acid-loving plants. For more specific advice on what material to add, how much and when, consult local garden experts such as Master Gardeners, County Extension agents or a good garden center. By the way, it’s easier to make acidic soils more alkaline than the other way around – but it’s easier still to go with the flow and grow plants naturally suited to the pH level your soil already has. MYTH: Nothing will grow under large pine or spruce trees because dropped needles turn the soil acidic over time. FACT: The real reason many plants don’t thrive under large evergreens is dense shade and extreme dryness. THE CURE: If you plant shade perennials where they face dry conditions, add compost to the soil when planting, water deeply each week if rain isn’t adequate, and use mulch. (See more tips on gardening in dry shade.) If all else fails, put shade-loving plants in containers and use those under your evergreen tree instead.